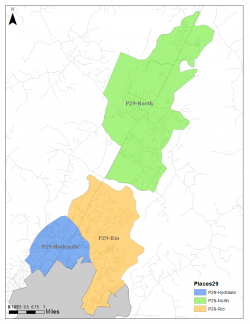 The Places29 Advisory Committee are three citizens' groups that oversees implementation of the Places29 Master Plan in Albemarle County. There are three distinct groups that serve different geographic areas. They are the Places29-Hydraulic Advisory Committee, Places29-North Advisory Committee and the Places29-Rio Advisory Committee. The three groups meet as a whole twice a year. ↑ Web. Boards and Commissions, County of Albemarle, retrieved February 1, 2011. ↑ Web. [Albemarle supervisors suspend Places29 panel Albemarle supervisors suspend Places29 panel], Sean Tubbs, Charlottesville Tomorrow, January 16, 2015, retrieved February 3, 2015. ↑ Web. Supervisors amend rules for master plan advisory groups, Sean Tubbs, Charlottesville Tomorrow, March 15, 2015, retrieved August 11, 2015. ↑ Web. Places29 council will not weigh in on bypass alternatives, Sean Tubbs, Charlottesville Tomorrow, April 27, 2014, retrieved April 28, 2014. This page was last edited on 10 February 2016, at 15:17.